We will look at several strategies to figure out your name in Japanese. The best way is to ask a Japanese speaker how he/she would write your name in Japanese. If your name is fairly common, you’ll want to make your life easier and write it the way everybody else does. In the end however, your name is your own and will stay with you forever once you start using it in Japanese documents. So make sure you’re comfortable with it by being familiar with Katakana and what your name will sound like. If you have a fairly common first name, you can find the Japanese equivalent at this website: http://japanesetranslator.co.uk/your-name-in-japanese/. Here’s a list of common surnames in Japanese. In the highly likely event that your surname is not on this list, you might want to see if there’s a famous landmark or person with your name. The WWWJDIC has a name dictionary you can search for other people with your name. *Make sure you select the Japanese Names (ENAMEDICT) dictionary. 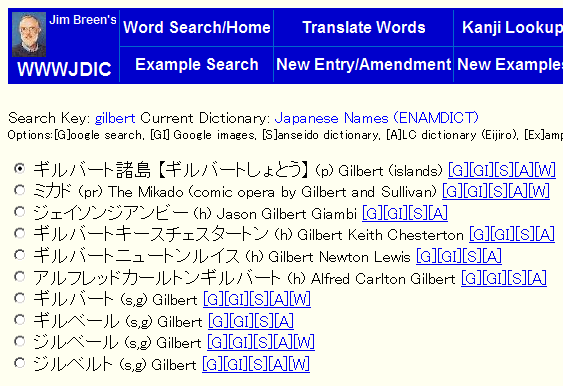 As you can see, it found several options for the name “Gilbert”. Since the one I was looking for was with a “g” sound and not a “j” sound, I would pick 「ギルバート」. In the end, if you can’t find your name anywhere, you may want to decide to roll with your own. 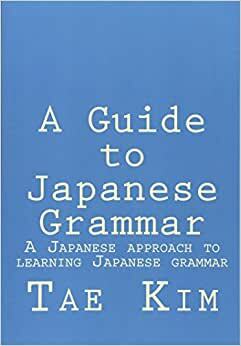 For example, while my name is Tae Kyong Kim in English, the “k” sound in Korean is closer to a hard “g”. So I decided on 「ギョン」 for my middle name. However, “Kim” is a very common name in Japanese and is written as 「キム」. Also, in Korean, there is no middle name so my actual name is TaeKyong. So while my full name is 「キム・テギョン」, I use Tae among friends. But 「テ」 is a bit too short so I go by 「テイ」, which is closer to the English pronunciation. Your own circumstances may be just as unique. Just make sure you’re familiar with Katakana and Japanese sounds in general before coming up with your own name and don’t hesitate to ask a Japanese speaker for his/her opinion if you’re unsure!